1. To measure liquid volume from the burettes. 2. To measure the temperature with a Celcius thermometer. 3. To observe the accuracy of the lab measures as lab instruments approach their capacity. 4. To plot the mass vs. volume of a solid and liquid on rectangular coordinate graph paper and observe a straight line plot. 5. To plot temperature change vs. time on a heating curve on rectangular coordinate graph paper. 6. To interpolate the density of a liquid and solid from the graph plot of mass vs volume. 7. To observe that boiling water maintains a constant temperature at its boiling point..
(1) Using a ring stand, Safety ring, ring, wire gauze, burner; place a 400 ml beaker with it half filled with water on the ring stand to be heated. Place a boiling chip in the water. (2) Place a thermometer into the water by attaching it to an extension clamp with a special cut thermometer stopper. Turn the divisions read around so that you may view the entire division markings from 25° to 100° C.
(3) Adjust the ring on the ring stand to about two inches above the top of the Fisher burner. Light the burner. Heat with the Fisher burner. Record the temperature at each ½ minute interval. When the water begins to boil, continue heating for an additional two minutes, recording the temperature every ½ minute. Why may you stop after two minutes? (4) Using beaker tongs, empty the water, cool the beaker, refill with water at room temperature. 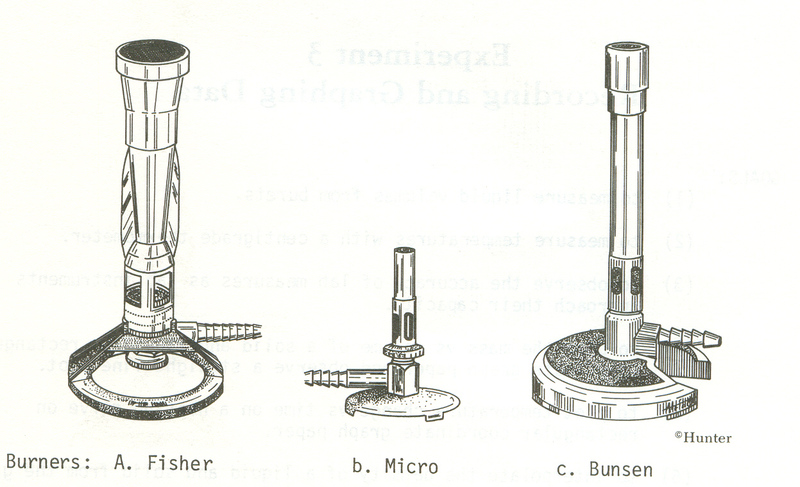 Use a Bunsen burner instead of the Fisher Burner. The distance between the ring and the Bunsen burner depends on the flame height. Light the Bunsen Burner. Adjust the burner for good blue flame, no yellow. Reheat and record the temperature at each one minute interval. Heat the water to boiling and boil for 2 additional minutes, recording the temperature every one minute. Have your instructor OK your data. (5) Plot time vs. temperature on graph paper. Put both plots superimposed on the same graph. Make as smooth a curve as possible for both heating curves. (1) Obtain approximately 50 ml of water in a 100 ml graduated cylinder and record the volume to the nearest 0.2 or 0.3 ml. (2) The student will weigh on a Top Loading Balance a size #2 or smaller rubber stopper. Then she/he will slide it gradually in the graduate without spilling or splashing water. Record the mass and the new volume to the correct number of decimal places. (3) The student will weigh a second stopper, then add it to the graduate Record the new volume. (4) The student will continue until a third, fourth and fifth is weighed separately and placed in the graduate. The volume is recorded with each stopper as in step 3. (5) Then the student will transform his/her data by calculating the mass and volume of one stopper, two stoppers together, three stoppers together, four together, and then all five together. The calculations will provide the student with five points of increasing size to be plotted on the graph. Have your instructor OK your final data transformation. (6) On rectangular coordinate paper, plot these five points. One axis of the graph will be mass, the other volume. Select the numbering of the axis so to use the entire paper, yet all five points must be included. (2) Clean, dry, and weigh on the Top Loading Balance a 50 ml Erlenmeyer flask. (3) Drain about 5 ml of water in the flask, record the buret reading and reweigh the flask. Estimate the buret reading to the nearest 0.02 or 0.03 ml. Have instructor OK the second burette reading. (4) In the same flask, drain 10 more ml of water and record the buret reading (nearest 0.2-0.3 mL) and reweigh. (5) Accumulate three more readings of approximately 10 ml each (to the nearest 0.02-0.03 mL) until you have used about 45 ml of water from the burette. Have your instructor Ok your final reading. Check the temperature of the water and record it. (6) Plot mass vs. volume on the graph. Read just your reading into 5, 15, 25, 35, 45 ml points. Be certain to adjust the axis so that you may use as much of paper as possible. (7) Draw a straight line to incorporate all points, and extrapolate the line to cross the axis at (0, 0). Read the mass at some volume other than a recorded point. Calculate the density and compare to the correct from the density temperature. Chart in Experiment 4. Calculate deviation and percent error.